All Arkansas Bar Association members have the opportunity to enroll for a complimentary Brooks Brothers Corporate Membership Card. As a Brooks Brothers Corporate Member, you will receive an everyday 15% Savings* on full priced merchandise at Brooks Brothers U.S. and Canadian stores, by phone and online at Brooks.Brothers.com. You will need to wait 30 minutes after you enroll before you register to shop online. In-Store: Present your Corporate Membership Card, temporary shopping pass or email confirmation at time of purchase. To Shop Online: For online purchases, you will need to complete an additional step. Note: Billing and shipping address will need to match the address provided when enrolling for a corporate membership card to receive the savings online. First time online shoppers must allow 30 minutes after you enroll before creating your Corporate Online Account. Complete “Create an Account” and include your Membership Number. Returning Members, sign in with your Username & Password. You will have the opportunity to print a temporary shopping pass at the end of the enrollment process. Your personalized membership card will be mailed to you in approximately 5-7 business days. If you have any questions during your enrollment process, please call our toll-free number below. Representatives are available Monday - Friday, 9am-5pm, ET. *Your membership entitles you to a 15% savings on full priced merchandise at all Brooks Brothers U.S. and Canadian stores, by phone and online at BrooksBrothers.com (for shipments to U.S. or Canada only). In order to receive your discount online, your billing and shipping address must match the address provided when enrolling for a Corporate Membership Card. 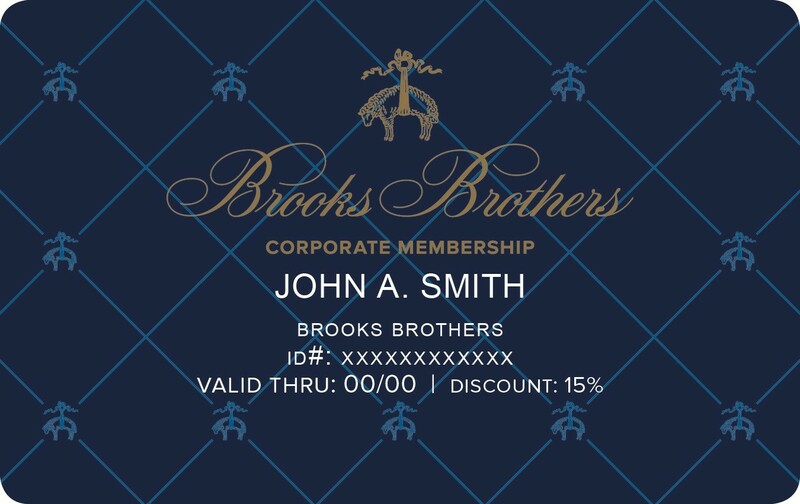 Please present your non-transferable Brooks Brothers Corporate Membership Card, temporary shopping pass or email confirmation to receive your discount in stores. Use of this card constitutes acceptance of all published Corporate Membership program terms and conditions. Discount cannot be combined with any other offer, discount or promotion and does not apply to taxes, shipping and handling, monogramming, engraving, alterations or personalization. Excludes charitable items, sample sale merchandise, gift card purchases, online custom shirts and suits, Suiting Essentials clothing purchases and applies to select accessories and select Brooks Brothers shoe styles only. No adjustment on previous or future purchases. If you return all or some of the merchandise, the dollar value of this discount will not be refunded or credited to your account. This Program may be modified or cancelled by Brooks Brothers at any time. For member assistance please call Corporate Incentive Services toll-free at 1.866.515.4747, M-F 9am – 5 pm, ET. For store locations please visit www.BrooksBrothers.com/stores.